Adequate packaging is the packaging that protects the goods or valuables contained within and protects the environment against the risks arising from the packed product or the packaging itself. All dispatched goods or valuables must have external packaging (a corrugated cardboard or a wooden box, a paper envelope, a plastic envelope/bag, or a cardboard postal tube) depending on the specific properties of the goods or valuables. Original manufacturer’s packaging is not considered to be appropriate packaging suitable for transportation. ATTENTION! If the packaging is inadequate or inappropriate, the Carrier shall not be liable for safe transportation of the consignment and shall not compensate any losses incurred by the Customer thereof, and may make a claim against the Customer for the damage incurred by the Carrier or third parties. Minimum size of a package must be sufficient to attach a packaging label of 100 x 150 mm to one of the sides of the package. If a package is too small, it is difficult to attach a label to it and if the label is unreadable, the consignment cannot be transported. 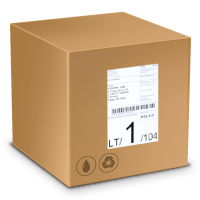 The standard weight of a package is up to 30 kg. The length on its longest side is 1200 mm. Maximum weight of a package is up to 30 kg. The length on its longest side is up to 3000 mm. The standard size of packaging (pallet): 1200 mm x 800 mm x 1700 mm. Maximum size of a non- standard pallet is 1200 mm x 2000 mm x 1900 mm. Please contact our customer services unit regarding transportation of non-standard packages. Goods or items (or parts thereof) may not protrude out of the package and/or pallet, because during loading to a vehicle or sorting in the distribution terminal protruding parts may get damaged. All packages must travel separately. Several packages attached together as one package is considered inappropriate packaging. Maximum weight of a package may not exceed 30 kg. The standard weight of a pallet is 700 kg. Maximum weight of a pallet may not exceed 900 kg. Large packages or packages in excess of 30 kg must be provided for transportation on pallets or in such packaging which would allow to use the standard mechanical cargo loading equipment. Heavier pallets must be re-packed onto several pallets not exceed the maximum weight. Packaging must be sufficiently durable to make it possible to lift the package held by its sides without any items contained therein falling out. A package may not contain heavier goods than the package can hold. For heavy, but smaller packages, the adequate size pallets must be used (quarter pallet, half pallet). Cardboard box – for products sensitive to pressure, impact or vibration. Envelope, plastic bags – For flexible, pressure-resistant packages. Cardboard postal tube – for products sensitive to pressure, impact or vibration. Only new, rigid corrugated cardboard boxes, envelopes or plastic bags shall be used for packaging. Rigid (cardboard) boxes with smooth sides (preferably – new) must be used for packaging to make it possible to lift the package held by its sides without any items contained therein falling out. A package may not contain heavier goods than the package can hold. Shrink wrap, a polyethylene bag, a paper bag or cloth are not considered adequate or appropriate packaging. Please note that the original manufacturer’s packaging is not suitable for transportation. To prevent such packaging from being damaged during transportation, it must be packed using the packaging suitable for transportation. Packages will be stacked on top of each other, so their sides must be rigid to withstand the pressure without collapsing from the weight 4–5 times greater than their own weight. Packages stacked on a pallet must be rigid so that they would neither press each other nor slip to the sides. To this end, sufficient amount of shrink wrap/tape must be used. Packaging must protect the items against damages as a result of turning, shaking or pushing the package or dropping the package from the height of not more than 1 m, and temperature ranges of 25–40°C. No special markings such as “do not turn over”, “fragile”, etc. shall be attached, because they are not taken into account during transportation sorting or transhipment processes. Non-standard, oversized consignments or volumetric consignments must be placed on the pallets, even if their weight does not exceed 30 kg and the consignments do not have packaging to prevent them from contact with other consignments and no other consignments can be put on top of them (wardrobes, machine-tools, hoardings, assembled furniture, glassware, etc.). Goods or valuables (or parts thereof) may not protrude out of the package and/or pallet, because during loading to a vehicle the protruding parts may get damaged or damage other packages. Where windows, glazed units, ceramic/stone mass goods (water-closets, washing-basins) are sent, they must be placed on a pallet/half-pallet. Where a consignment that must always be kept in a horizontal or vertical position is sent, it must be placed on a pallet. Where goods or valuables sensitive to pressure or contact with other consignments are placed on a pallet, they must have external packaging. Pallets used for packaging must be in good condition and strong, they must not be mended/repaired or otherwise modified. The external packaging must withstand the diagonal drop from the height of 1 m.
Empty space within a package must be filled with packing material (paper, shaving, cotton, plastic foam, bubble wrap). If the empty space is not filled, items inside the package will not be stable, knock against each other and against the packaging thus standing a risk of sustaining breaking or other damage. Do not use the box which is too big for your item and therefore requires filling as there is a risk that the box may be crushed during transportation. Where glass containers/ceramics or any other breakable items are sent, they have to be isolated from each other by cardboard inserts, bubble wrap or plastic foam to prevent from being damaged during transportation. The items must not have contact with the sides of the box and this can be ensured using packing material. Paper may be used for very light packages. Any gaps between the sides of a box and an item (including original manufacturer’s packaging) must be filled with packaging material. If liquids are in metal containers, which may open under pressure (paint, hardeners, plasters, etc. ), each such container must be placed in a separate plastic bag to protect other goods within the package in case of a spillage. The VENIPAK label must be placed on the side of the package with the lids at the top. In addition, it must be marked “paint” next to the label. Corrugated cardboard boxes must be taped with adhesive tape wrapped around the box in three places at least. If too little adhesive tape is used the box may fail to hold the items within and may open. Packaging must make it impossible to access the content of a package without damaging the package itself. We suggest using a special adhesive tape with logos that can only be purchased by placing a special order.